After a stagnant decline from many months, Windows 10 has shown signs of revival. 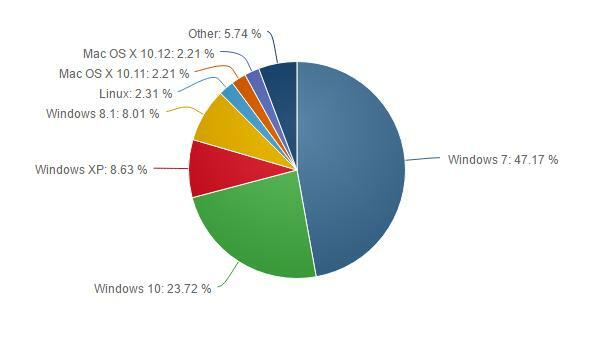 Windows 10 has increased its share from 22.59 to 23.72 percent. This is a pretty significant as a little percentage could mean million. This shows people have started adopting Windows 10, which could be a reason of fixing bugs with the Anniversary update. For the first time in months, Windows 7 share has decreased with a significant margin.The share dropped from 48.38 to 47.17 percent. This could mean people moving have moved from Windows 10. Windows 8.1 is dropping sharply, and these new stats put the at 8.01 percent, while Windows 8 operating system stands at a mere 1.96 percent. The almost 1 and half decade OS has increased its share strangely. The OS now stands at 8.63 percent, greater than Windows 8.1. FWIW, the OS started the year with 11 percent around and had a lots of downs and a little ups like these in the year. For those who are wondering, still Windows XP powers a lot of computers and the owners do not upgrade their systems either due to compatibility issues or finance. But still using XP poses a lot of risks, as the software giant has already stopped patching this OS.